November 27, 2013 Pilar B. Uh, I change him and wipe the floor? Uh, I sweep up the pieces and throw them away? 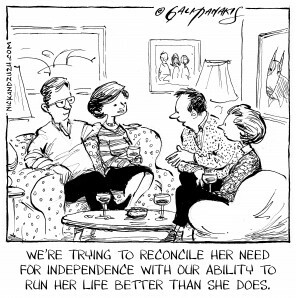 We all want our children to grow up to be responsible, self-aware, and self-disciplined. Yet, for fear of a little puddle, a tiny nick on the finger, or a couple of smashed $3 plates, we are denying them the very experiences that will help them get there. What are we afraid of? A Biblical flood of urine overtaking our homes? The destruction of our heirloom Limoges glassware and porcelain china? A severed artery or amputated limb? Or are we just afraid of the inconvenience of wet underwear, broken plates, and finger scrapes? In my view, you can either deal with the hassles of letting your child experience real consequences now… Or later. If you avoid the messes now, they’ll just get bigger and harder to clean up the older your child gets. And guess who’ll still be doing the clean-up? March 20, 2013 Pilar B. We have two of the world’s tiniest bathrooms, so when I decided 7 months ago that I would help Zach develop toileting awareness, I had to find a way to incorporate potties and clean & dirty underwear bins into pretty tight spaces. Our arrangement has worked out beautifully, which is great because I spend a big chunk of my day kneeling by the potty! We use the Baby Bjorn high backed potty, and I got the underwear bins at the Container Store. 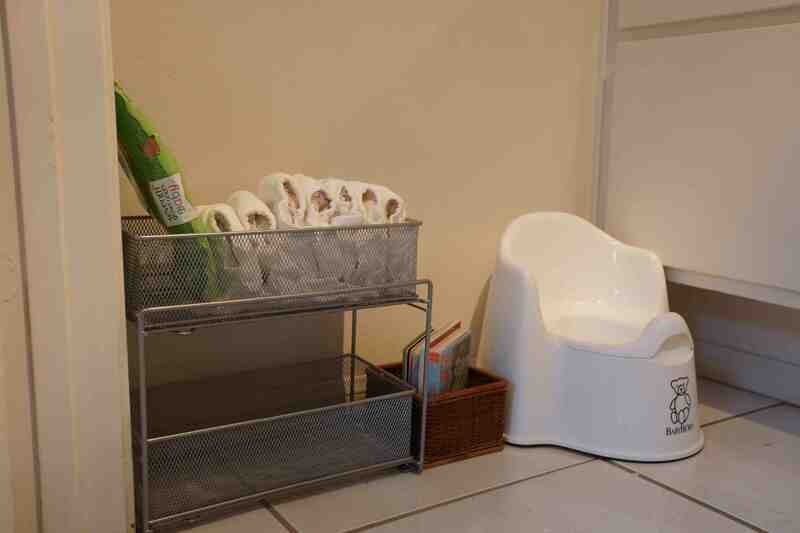 We keep a couple of books on rotation between the potty and the bin… And that’s it! 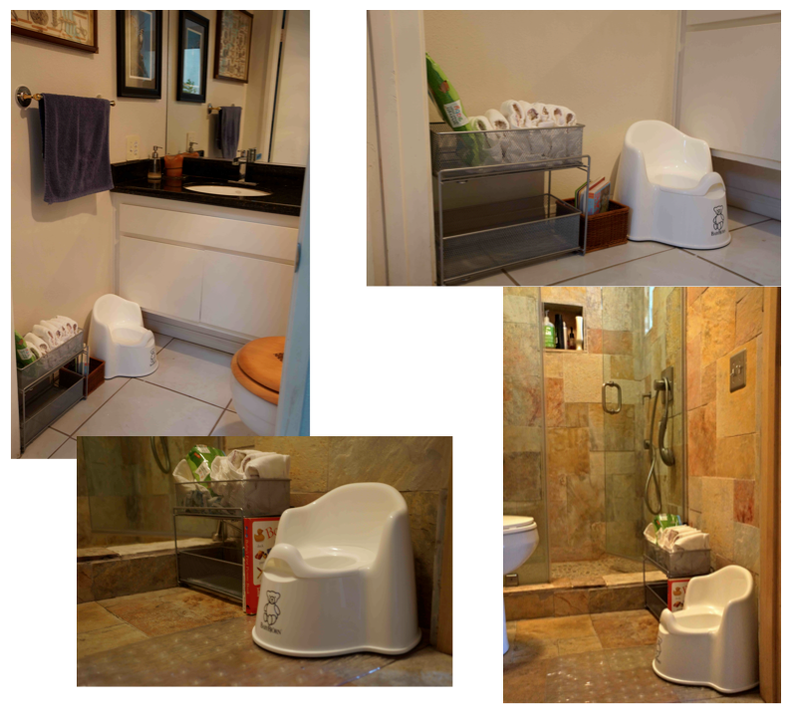 Proof that you can ALWAYS find effective ways to modify the environment to accommodate your child’s changing needs. October 8, 2012 Pilar B. Our brief journey has been hassle-free and has become a daily reminder of the respect we should have towards the youngest members of our species. I keep asking myself why I waited so long to introduce this process, even though we’re starting a lot earlier than most families. He seems so content every time he relieves himself on the potty, and his discomfort when his cloth diaper is wet or soiled is more evident now. We are approaching toilet education with the view that, from Zach’s perspective, using the potty is not a big deal since elimination is a natural bodily function. Therefore, we don’t make a huge celebration out of every pee, nor do we pressure him if he’s not willing to use the potty. We have just included sitting on the potty for 2-5 minutes as part of our daily rhythm and routine – first thing in the morning, last thing before bedtime, and before and after each nap. Zach eliminates on the potty on average about three out of the six opportunities he gets every day. Some days he’s happy to sit on the potty for 5 minutes, and other days he wriggles out of it as soon as his bottom touches the plastic. We respect his wishes every time. His awareness is definitely growing; at first it seemed he peed by chance, after several minutes of sitting, but now he’ll go as soon as he sits down. We’re not the only ones having success with early toilet education: a close friend decided to keep her 11-month old son diaper-free for a couple of days to determine his urination patterns. Based on her observations, she started taking him to the bathroom at certain intervals and now the little boy is successfully using the potty! Yesterday, my husband, Zach and I went to a gathering with several French and Belgian families. Upon finding out I was a Montessori teacher, a French woman asked how I practiced Montessori at home. I told her we did some things a little differently than most American families, and gave her the example of the floor bed and early toilet education. While she was surprised by the floor bed, she told me that potty training during the first year of life made perfect sense from her cultural viewpoint. And then a Belgian mom told me that her child had regular bowel movements in the potty by 12 months of age and was completely dry by 18 months. P.S. 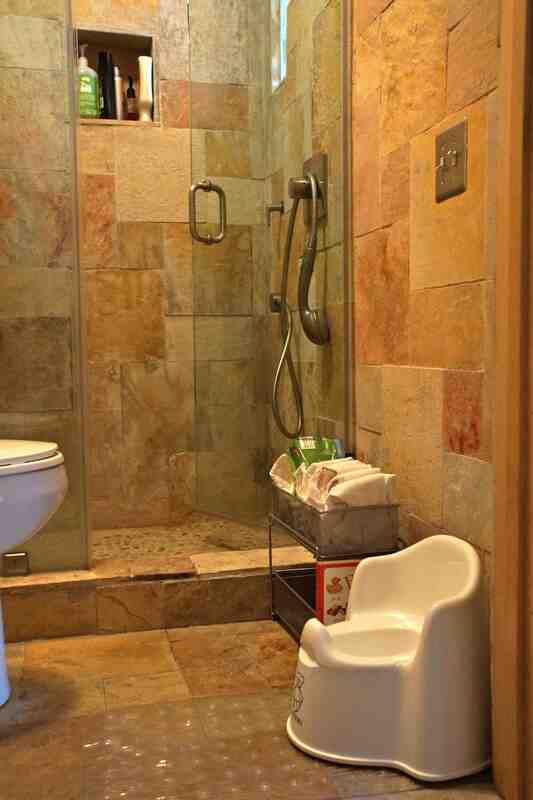 : Remember my plans to travel to Mexico with our potty? Well, my mother – the most awesome Montessori mother/grandmother alive – just bought him his very own potty to use during our visit! Hurray for supportive grandparents!!! September 23, 2012 February 10, 2013 Pilar B.
I’m currently reading Diaper Free Before Three, a fabulous book about early toilet training that supports several tenets of the Montessori philosophy (and even quotes Dr. Montessori). It reviews the history of American toilet training from the 1800’s to the present and gives logical, scientific, and thoroughly convincing arguments for helping young children achieve toileting independence at a young age (note: it’s not a guide for practicing elimination communication). I considered doing elimination communication (EC) before Zach was born, but once he came into our lives I had my plate full just figuring out the breastfeeding, crying (his and mine!) and sleeping (or lack thereof). I had no time or energy to be worrying about catching pees or poops! 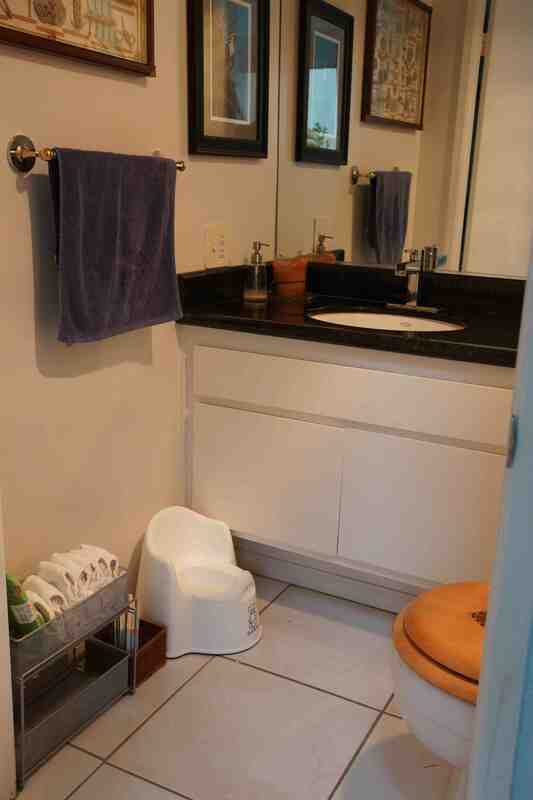 We use cloth diapers, but that’s been the extent of my efforts in the toileting department. About a month ago (when Zach turned 7 months) I realized that he had started having bowel movements on a regular schedule. He is also starting to fight diaper changes, a major indicator (at least to me) that he’s ready to move on from diapers. After some research (yes, I researched potties), I settled on the Baby Bjorn. 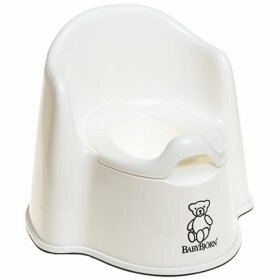 I chose that potty based on many positive reviews, which praised its high back rest and clean design (no crevices from which to dig out poop). No poop-digging? Sign me up! This morning, I placed the potties in our two bathrooms to get Zach used to the idea of them being there. I really wasn’t thinking of sitting him on the potty until the end of October, after we return from a trip to Mexico. It seemed wrong to toilet train him for three weeks and then stop for a week during our trip. I did, however, decide that I would not use diaper covers when we are home, so that I can start to understand his urination patterns. Today, before his noon nap, I changed his diaper and only used the prefold (no cover). When he woke up, I noticed he had had a bowel movement. I took him to the bathroom to change him and when I was taking off the diaper I realized that the front was dry. I wiped his bottom clean but instead of putting on a clean diaper I told him to try to pee on the potty. I put him on the potty and he seemed quite at ease. He looked around, and not ten seconds later started to pee!! He finished and smiled, clearly satisfied with his new experience! I couldn’t believe my eyes! It works! And the best part was that it was so natural for both of us… No praise, no stickers, no confusion. Just a baby boy following his body’s urges and a first-time momma following her child. Update: I’ve been sitting Zach on the potty daily for the past three days, every time he wakes up and after every meal. I’ve yet to catch a poop but he pees just about every time! I love how natural and matter-of-fact the process is when you introduce your child to toileting at an early age. By starting now, I’m setting the expectation that pee and poo belong in the toilet. Therefore, when he’s old enough to walk and become conscious of his body’s elimination needs, he’ll know where to go! To me, this makes more sense than letting your child get used to eliminating in a diaper and then one day letting him know that it’s wrong.